Figure 1. 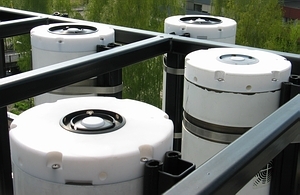 Several generations of GUV filter radiometers deployed at the 2005 intercomparison in Oslo, Norway. Since the late 1980s, Biospherical Instruments has been regularly participating in both national and international intercomparisons of radiometers. For example, in 1994, an instrument of the BSI-operated NSF UV Monitoring Network participated in one of the first international intercomparisons of UV spectroradiometers ever organized. The campaign took place in Garmisch-Partenkirchen, Germany, and also included groups from Australia and New Zealand. The campaign formed the basis of a study on geographical differences in UV radiation (Seckmeyer et al. 1995). Another example is our participation in the first international intercomparison of multiband filter radiometers in Oslo, Norway in 2005 (Johnsen et al. 2008), Figure 1. Results from the 2003 North American interagency intercomparison of ultraviolet spectroradiometers (Lantz et al. 2008) and from an intercomparision organized jointly with New Zealand's National Institute of Water and Atmospheric Research (Bernhard et al. 2007) confirmed the excellent quality of measurements of the NSF UV Monitoring Network. These results also demonstrated that the network's data meet the quality requirements of the Network for the Detection of Atmospheric Composition Change (NDACC). In response, in 2009, NDACC invited Biospherical Instruments to submit these data to NDACC’s data archive. Figure 2. Comparison of two optical profiling systems (C-OPS and BioPRO) from Biospherical Instruments. BSI also participated in several intercomparisons of standards used in calibrating marine radiometers for NASA (Meister et al. 2002 and 2003). Measurements performed by BSI agreed to within ±1% with data from the reference radiometers used in the two campaigns. This level of agreement was deemed "excellent." Standards of BSI were also successfully compared with those maintained by NOAA's Central UV Calibration Facility. We are currently jointly conducting with NIST, instrument analysis related to the OSPREy program, with NIST. Results of these intercomparisons were published in agency reports and peer-reviewed journals, and have been used to improve instrumentation, measurement protocols, and data analysis procedures. It is also possible for you, our customer, to bring your instruments and standards to us for comparison with our in-house units. The measurements from your instruments can also be compared with the solar measurements of our SUV-100 spectroradiometer (permanently installed on BSI's rooftop facility), as well as comparing your profiling instruments with our own in-house sensors (Figure 2). The following citations, listed by date, provide the details of some of the intercomparisons in which Biospherical Instruments participated. Bernhard, G., C.R. Booth, J.C. Ehramjian, R. Stone, and E.G. Dutton (2007). Ultraviolet and visible radiation at Barrow, Alaska: Climatology and influencing factors on the basis of version 2 National Science Foundation network data, J. Geophys. Res., 112, D09101, doi:10.1029/2006JD007865. (P). Johnsen, B., B. Kjeldstad, T.N. Aalerud, L.T. Nilsen, J. Schreder, M. Blumthaler, G. Bernhard, A. Bagheri, B. Bhattarai, C. Topaloglou, G. Zablocki, O. Meinander, B.A. Høiskar, R. Haugen, W.S. Durham, G. Janson, A.R. Marrero, A. Dahlback, D. Bolsée, J.R. Slusser, J. Stamnes, C. Torres, A.R.D. Smedley, L.-E. Paulsson, K. Lakkala, A.R. Webb, J.B. Ørbæk, A.A. Grimenes, T. Ringstad, T. Langet, and W. Josefsson. (2006). International intercomparison of multiband filter radiometers in Oslo 2005, in: Remote Sensing of Clouds and the Atmosphere XI, edited by J. R. Slusser, K. Schäfer, and A. Comeron, Proc. SPIE, 6362, 63620W-1-63620W-12, doi:10.1117/12.688918. Johnsen, B., and M. Hannevik, eds. (1997). The 1995 intercomparison of UV and PAR instruments at the University of Oslo. StralevernRapport 1997, 7. Meister, G., P. Abel, R. Barnes, J. Cooper, C. Davis, M. Godin, D. Goebel, G. Fargion, R. Frouin, D. Korwan, R. Maffione, C. McClain, S. McLean, D. Menzies, A. Poteau, J. Robertson, and J. Sherman. (2002). The First SIMBIOS Radiometric Intercomparison (SIMRIC-1), April–September 2001. NASA Tech. Memo. 2002–210006. NASA Goddard Space Flight Center, Greenbelt, Maryland, 60 pp. Meister, G., P. Abel, K. Carder, A. Chaplin, D. Clark, H. Cooper, C. Davis, D. English, G. Fargion, M. Feinholz, R. Frouin, F. Hoge, D. Korwan, G. Lazin, C. McClain, S. McLean, D. Menzies, A. Poteau, J. Robertson, J. Sherman, K. Voss, and J. Yungel. (2003). The Second SIMBIOS Radiometric Intercomparision (SIMRIC-2). NASA Tech. Memo. 2002–210006, Vol. 2. NASA Goddard Space Flight Center, Greenbelt, Maryland, 71 pp.